View all the Ting plans that work with the Alcatel GO FLIP. Compare Ting plans that are compatible with the Alcatel GO FLIP using our tool below. 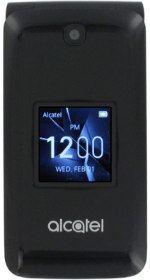 The Alcatel GO FLIP is a clamshell device running on Kai 1.0 OS out of its box. It comes with a 2.3-inch IPS TFT display with 240x320 resolution. It is equipped with a 1.1 GHz Quad-Core Qualcomm Snapdragon 210 processor and 512 MB of RAM. There is an onboard storage of 4GB plus a microSD card slot for up to 32GB memory expansion. For photos, the device has a 2MP front-facing camera with 720p video recording. The removable 1,350 mAh Li-Ion battery has the ability to last up to 8 hours of talk time and 280 hours in standby mode.